The world's most iconic buildings can be considered time capsules; buildings that survive through the years represent the values and aspirations of the people who built them or added to them. Architects use size, massing, ornamentation, symmetry or asymmetry, and other design features to project an overall image of a structure. Here, we explore the design of The White House. After declaring independence from Britain in 1776, the Congress of the United States searched the Mid-Atlantic States looking for a base. At various times, Philadelphia, Princeton, Trenton, Annapolis, and other cities had served as the nation’s capital. European observes ridiculed the US for lacking a permanent presidential home, having had monuments for hundreds if not thousands of years. In 1789, after the ratification of the U.S. Constitution created a stronger national government, President George Washington and a newly chosen Congress assumed office in the temporary capital of New York City after deciding to build a permanent capital. 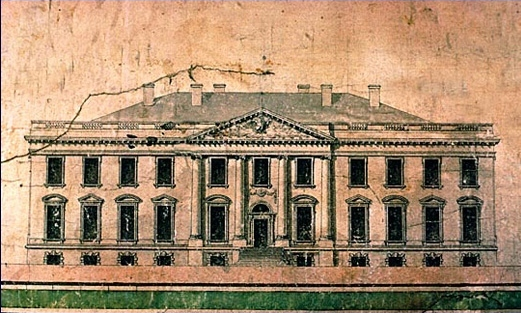 In 1792, at Washington’s request, Secretary of State Thomas Jefferson announced an architectural competition to produce design drawings for the President’s House. Washington insisted that the building should be made of stone, so that it would have a more substantial appearance, much like the most important buildings in Europe. On July 16, 1792, President Washington examined at least six designs submitted in the President’s House architectural competition. The following day, James Hoban was declared winner. The building was first made white with lime-based whitewash in 1798, when its walls were finished, simply as a means of protecting the porous stone from freezing. Meant to wear off for the most part, leaving cracks and crevices filled, the whitewash was never allowed to weather, but was refreshed periodically until the structure at last was painted with white lead paint in 1818. By that time it had for more than a decade been known as "The White House." The name, though in common use, remained a nickname until September 1901, when Theodore Roosevelt made it official. 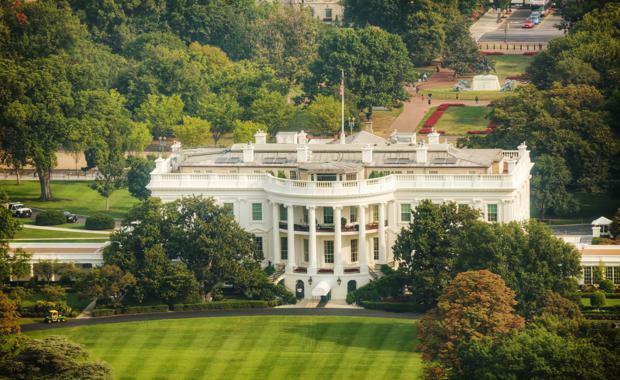 It takes 300 gallons of white paint to cover the exterior of just the residence portion of the White House (center), excluding the West and East Wings. It took almost ten years to build The White House. 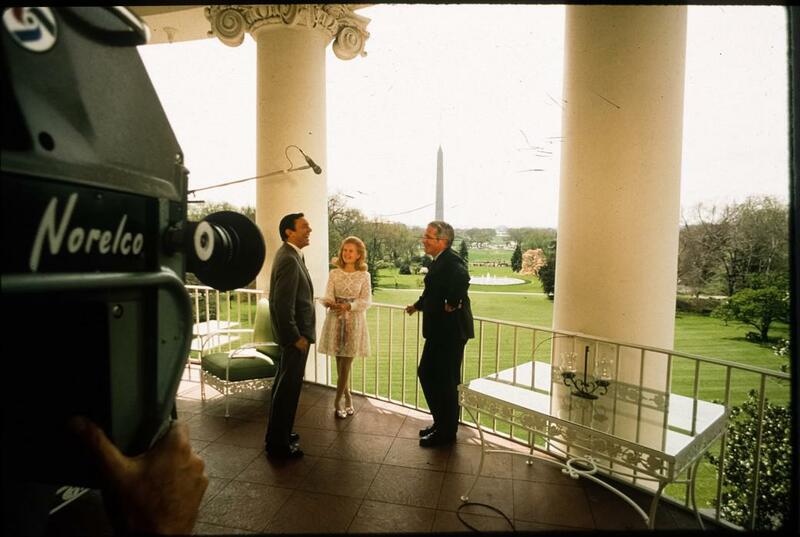 Tricia Nixon speaks with Mike Wallace and Harry Reasoner on the Truman Balcony. The White House south grounds, the Washington Monument and Jefferson Monument are all visible from President Truman's 1947 addition to the house. It was considered remarkable that James Hoban was able to direct a reconstruction of the house (after the British torched the house in 1814) in slightly less than three years. This was possible in part because some of the stone walls could be reused, but the main reason was that Hoban altered the structural scheme of the house by substituting timber for brick in some of the interior partitions. The shortcut saved time, but produced a weaker structure than the one George Washington watched over in the 1790s. The ill effects of this decision would cause the virtual demolition and rebuilding of the White House some 130 years later in 1948-1952. External forces also contributed to the hasty rise of the President's House: innovation, business prosperity, and the success of manufacturing in the United States. In the invoices of the 1790s, the names of individual craftsmen and tradesmen abound, but in the reconstruction records after 1814 were bills from manufacturers, merchants, suppliers, contractors and other businessmen predominate. The Oval Office has been the main office for the president since President Taft first worked in it about October 1909. After his inauguration President Taft held a competition to select an architect to enlarge and make permanent the West Wing's "temporary" Executive office built during Theodore Roosevelt's first term. Taft ordered a southward extension of the existing structure. The winning architect was Nathan C. Wyeth of Washington, D.C. who designed the wing expansion with a new office for the President. 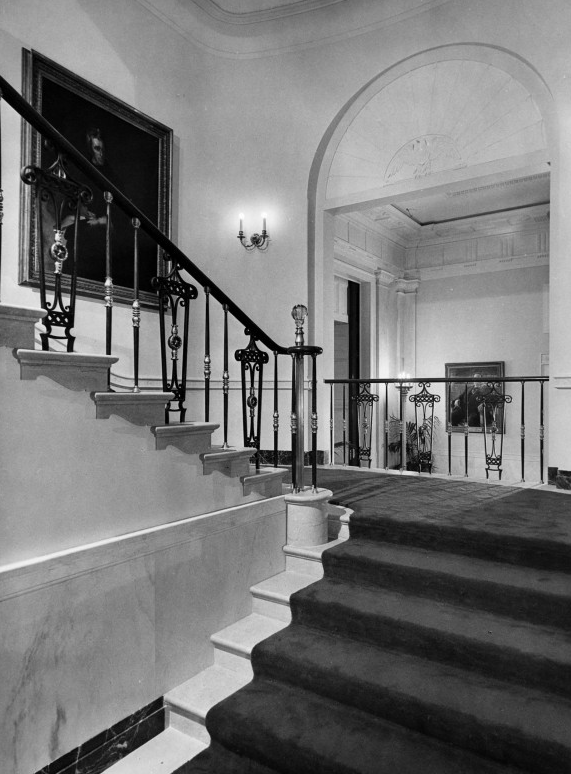 Wyeth modelled the new president's office after the White House's original oval-shaped Blue Room. Before moving to the president's house in Philadelphia in 1791, George Washington ordered that the straight rear walls of the principal two rooms be rebuilt into a semi-circular form, or bows. In these bowed walls may be found the inspiration for the oval shape of the Blue Room. This distinctive shape apparently had been preferred by Washington to create a suitable space for a formal reception known as a "levee." The levee, a tradition borrowed from the English court, was a formal occasion to allow men of prominence to meet the president. Replete with formal dress, silver buckles, and powdered hair, the event was a stiff public ceremony almost military in its starkness. Invited guests entered the room and walked over to the president standing before the fireplace and bowed as a presidential aide made a low announcement of their names. The visitor then stepped back to his place. After fifteen minutes the doors were closed and the group would have assembled in a circle. The president would then walk around the circle, addressing each man by his name from memory with some pleasantry or studied remark of congratulation, which might have a political connotation. He bowed, but never shook hands. When he had rounded the circle, the president returned to his place before the mantel and stood until, at a signal from an aide, the guests went to him, one by one, bowed without saying anything, and left the room. The oval shaped design is symbolic of the dramatisation and the formality of meeting the President. December 10, 1938, a grand piano was presented to President Franklin D. Roosevelt for the White House by Theodore Steinway. The piano replaced another Steinway at the White House, a gilded and painted grand piano which had been given in 1903 (now on exhibit in the Smithsonian Institution). Seeking to create a unique and distinguished “State Piano,” Eric Gugler, a New York architect, friend of the Roosevelts, and White House consultant in the 1930s, chose a square form with simpler lines than the routine double-curve form. The case was made of fine Honduran mahogany. Although it measures seven inches longer than the standard nine-foot Steinway grand, it has identical musical works. 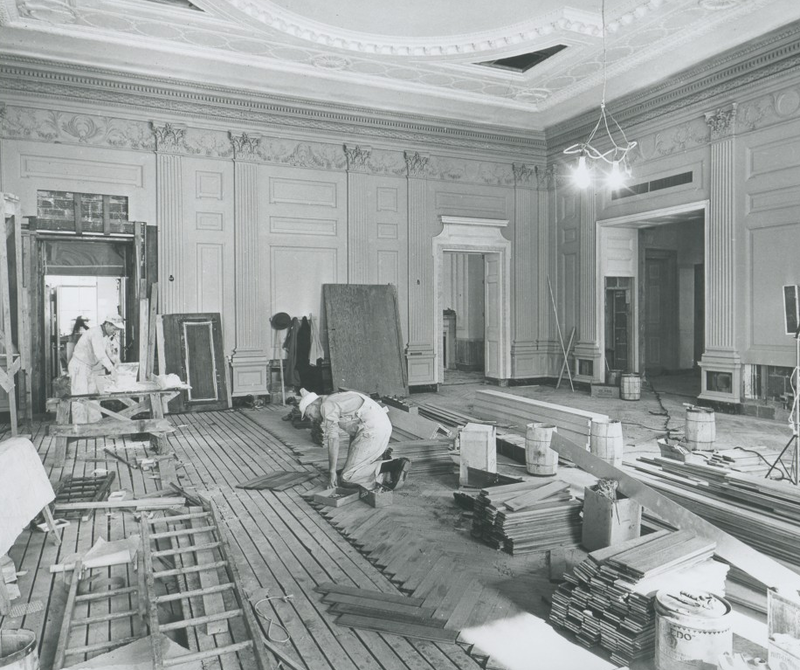 Carpenters lay the quartered white oak flooring in a herringbone pattern in the State Dining Room on January 23, 1952. 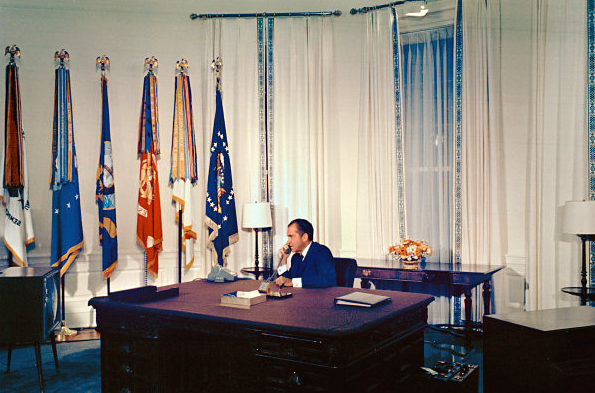 Source: whitehousehistory.orgFloor area (total of 6 floors) approximately 55,000 square feet. 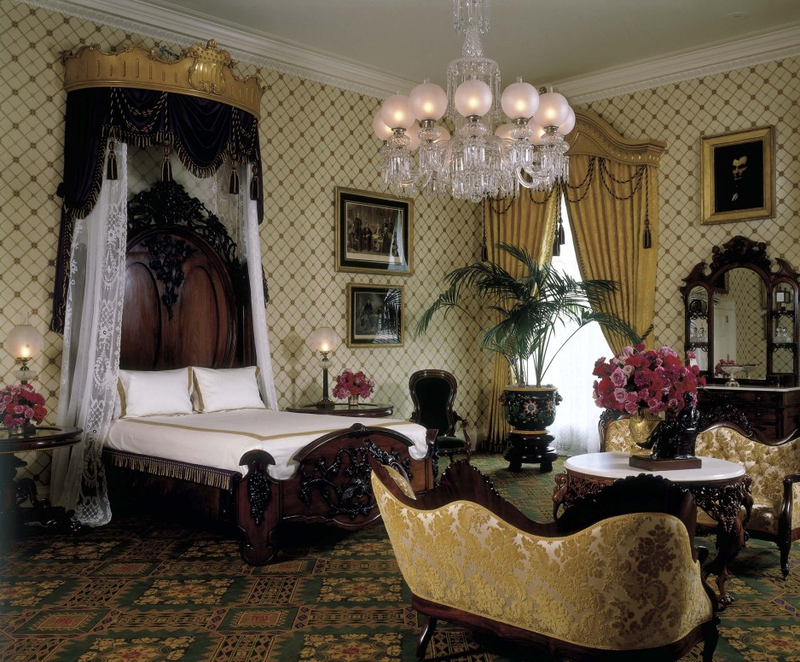 The White House first received a form of plumbing during John Quincy Adams’ presidency (1825-1829). Adams was an avid gardener, and an iron garden pump with "nine spout holes" was attached to a well at the neighboring Treasury building and provided water for the White House grounds.